3.2. 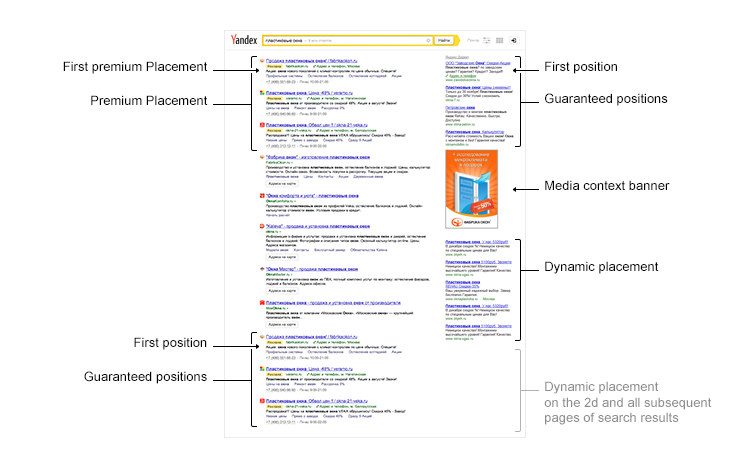 When selecting ads to be displayed on the Advertising spaces specified in 2.1, 2.3, 2.4, 2.5 of these Rules, a key phrase/word (without stop words (http://direct.yandex.ru/help/?id=990397#990402)) and also the quality factor, CTR and Cost per Click set by the Advertiser shall be taken into account. 3.7. Selection of Ads for impression on the Advertising spaces specified in 2.5 of these Rules and their distribution among pages shall be made in a descending order based on the product of CTR and Cost per Click. In this case, the position of an ad on a page shall be determined by the fixed Cost per Click with consideration of the rate set by the Advertiser according to cl. 3.21 of the Rules, that is, selected ads displayed on each page shall be arranged in a descending order by the Cost per Click. 3.9. In case of overlapping of key phrases in different Ads within one and the same advertising campaign, the rates fixed for such overlapping key words will not raise the Cost per Click of such Ads. Only one of such Ads with the best product of CTR and Cost per Click will be selected for impression. 3.10. In case of overlapping of key phrases in Ads linking to the pages of one and the same website, only one of such Ads with the best product of CTR and Cost per Click will be selected for impression. 3.11.2. To determine the minimum Cost per Click applicable for search, the quality factor and efficiency factor shall be taken into account together. However, the minimum Cost per Click is calculated in such a way as to ensure (but not guarantee) the display of the majority of Ads from the Group of Ads on the Advertising Space selected by the advertiser in the manner specified in cl. 3.20 of the Rules. 3.12. CTR of an Ad shall be calculated based on the data for the last 28 days, during which the Ad was displayed; or a forecast CTR value shall be used (if no sufficient statistics are available to assess CTR for the above period). 3.14. 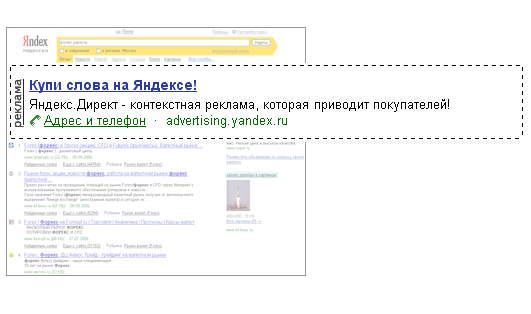 If any Yandex.Direct ad and any Yandex.Market product offering contain links to one and the same Internet information resource (website/domain), or to websites recognized as similar according to paragraph 3.14 of these Rules, only such Ad or only such product offering, whichever has the best product of CTR and the Cost per Click, will be displayed on the Advertising Spaces. 3.20.1. Remove from Advertising campaign key phrases/words, in respect of which the displaying of ads was suspended by Yandex on all Advertising Spaces according to the version of the Ad Serving Rules in force as of the date of such suspension (hereinafter referred as “Fully suspended phrases”). Yandex undertakes to notify Advertiser regarding the removal of Fully suspended phrases not later than 10 (ten) calendar days prior to such removal. 3.20.2. 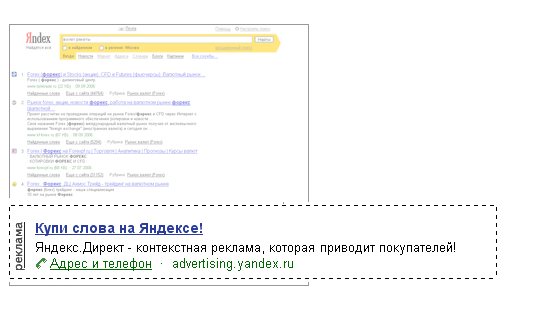 Fully suspend displaying of ads via key words/phrases, in respect of which the displaying of ads was suspended by Yandex on all Advertising Spaces (excluding the Advertising Spaces set in the section 2.2 of these Rules) according to the version of the Ad Serving Rules in force as of the date of such suspension (hereinafter referred as “Phrases, suspended on search”). Yandex undertakes to notify the Advertiser regarding the suspension of Phrases, suspended on search, not later than 10 (ten) calendar days prior to such suspension. 3.21. Increasing rate to the Cost per Click set by the Advertiser in the Client web interface affects the selection of Ads to be displayed on Advertising spaces, specified in cl. 2 of the Rules, the Ad position where it is supposed to be displayed, the number of Ads displayed on the specified Advertising Spaces.